When I first started riding my LX150, I expected to mainly use it for weekend jaunts within town and around the country side. What I discovered, however, was that I was using it far more as my daily rider, running errands and transporting me to and from work. I also learned that there are limits to the carrying capacity of the smaller scooter. A trip to the store for more than a few bags of groceries was a challenge. A flat of pop on the rear rack, a couple of bags hanging off the seat hook, and another within the pet carrier, and that was about it. I needed more carrying space on the scooter. I could add a topcase, but I didn't want to lose the flexibility or look of my folding rear rack. More importantly, I only required the extra carrying space once in a while, so having a temporary solution was necessary. So I went looking for pillion case, and was excited to learn of the Pak Rest from SX Appeal (Motorsport Scooters). Fortunately for me, Father's Day was upon us and my family bought me one as a gift. 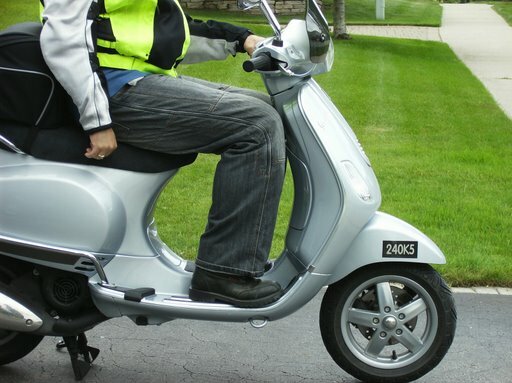 The Pak Rest is reasonably priced at $129, and would fit the budget of many scooterists. Mine was on sale, which made it even more of a deal. Motorsport Scooters shipped the case out quickly, and it arrived on my doorstep within 2 weeks. While that may sound like a long time to American readers, Canadian and readers from other countries are experienced to delays while goods travel across borders. My excitement receiving the package was muted by the cost of shipping and taxes - an additional $65! 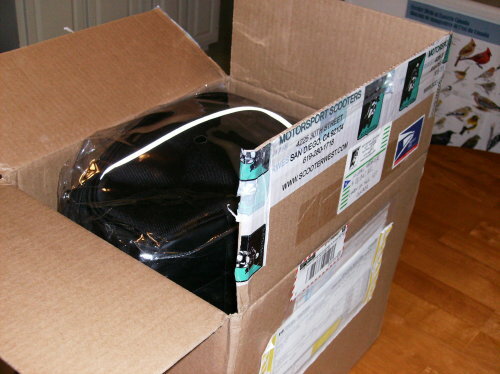 Even using the least expensive shipping methods, there is no getting around the fact that this is a large package, and size means money when shipping is involved. I'll give credit to Max and the crew at Motorsport Scooters. They marked the invoice as "motorcycle parts" which avoided the application of duties and tariffs. Opening the package, you can see that care was taken to ensure that the contents would not be damaged in transit. Taking the bag out of the box, you are immediately struck by its size and weight! SX Appeal lists the bag's dimensions as 14 inches long by 14 inches wide by 10 inches tall, though it looks larger. It is no flimsy gym bag, and is made of substantial materials that give the Pak Rest to maintain its shape. You needn't worry that this bag will soon fall apart! 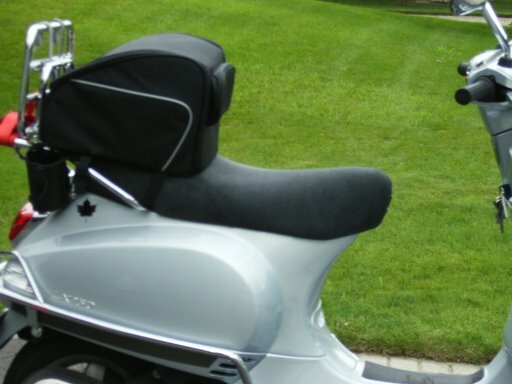 The Pak Rest is designed to mount on the seat using two adjustable straps. Convenient instructions are provided from SX Appeal. Locating the forward strap was simple. 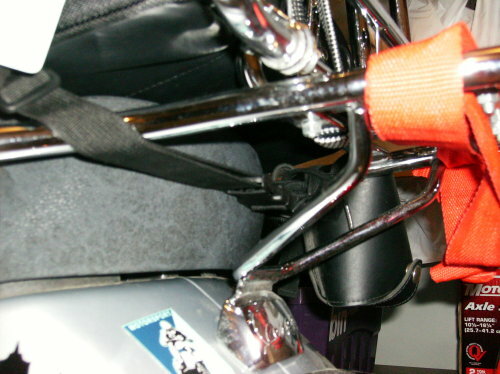 If fit naturally through the two indentations where the grab rails mount underneath the seat. However, finding a suitable location for the rear strap was more challenging. If you try to place it in front of the rear seat latch, it catches on the battery cover and prevents the seat from closing. Similarly, moving it too close to the seat latch causes problems. At first, I just left it off, thinking that the second strap was not really necessary. 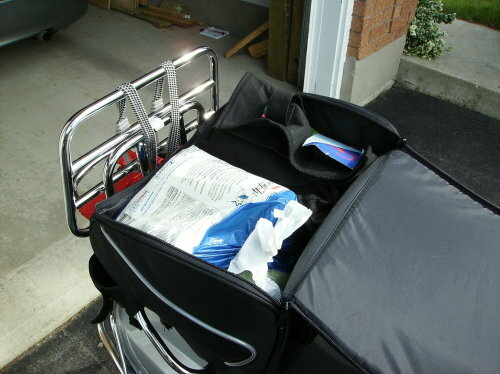 Then I began to worry about carrying heavier loads in the bag, with only one strap to keep it attached to the scooter. 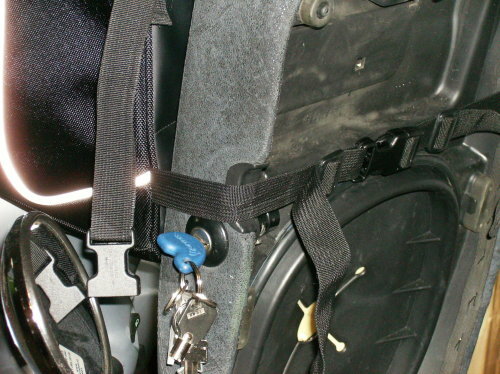 I was able to wrap the straps around the rear grab rails, and that seemed to work, until I needed to lift the seat. I finally managed to slide the rear strap just over the end of the seat, and just behind the latch. Even though I can't keep it tight, it seems to do the job, and I haven't noticed a problem with the load shifting when carrying heavier items. At this point, I should point out two characteristics of the Pak Rest. 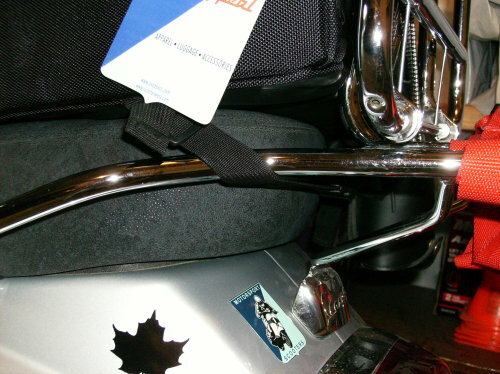 First, the non-slip bottom surface of the bag appeared to do its intended function on the vinyl seat of my LX150. I can not comment on whether the same would, or would not, be true for a leather seat. 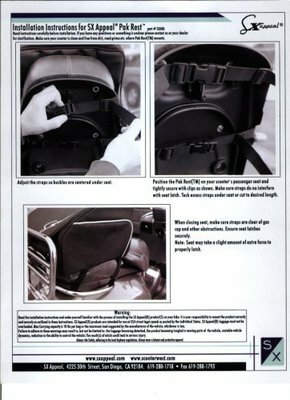 Second, when using the Pak Rest, some planning is necessary to make sure you are finished using the under seat compartment before you fill up the bag. I had to refuel on a trip home, and lifting the seat with a heavy load isn't ideal. Once you have located the appropriate spots for the straps, and adjusted their lengths, the bag can easily and quickly be attached, and removed, using the quick release clasps. A really useful feature is having the carrying handle on the rear of the bag, so that you can hold it with one hand while attaching the straps with the other! Good thinking, SX Appeal! For my purposes, the ability to add or remove the bag easily was necessary, and the approach used with the Pak Rest made this ideal. 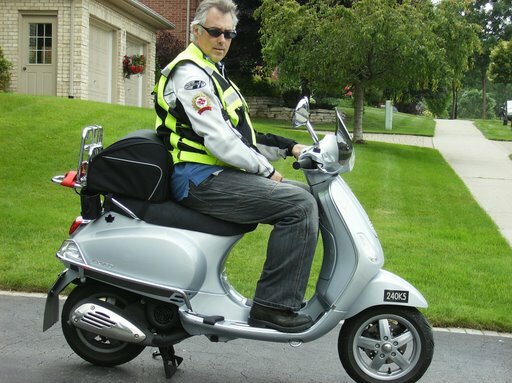 On the scooter, the bag is attractive and does not detract too much from the look of the scooter. Granted, it may not be everyone's choice, but I like it! One concern that I had before receiving the bag was how much room it would take up on my seat. As you can see from the pictures, it extends more forward than the "hump" thaat separates the pillion seat from the rider's position. This remains the main concern that I have with the bag; it is simply too long. Some more photos of the Pak Rest mounted on a LX150. This time, from the front- and rear-sides. 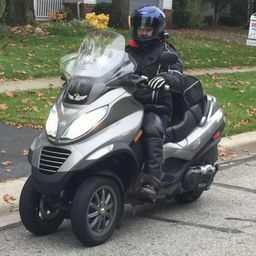 Here is a picture showing me on the scooter with the Pak Rest attached (you can tell from my expression that I was growing impatient with my son's photography speed). Now I am wearing knee armour underneath my Draggin' Jeans, but you can see how little room I have in front of the glovebox. I felt like I was on a Yamaha Vino again! Here are two other photos, showing in closer detail the amount of knee room with, and without riding pants on. Keep in mind, I have an LX150. 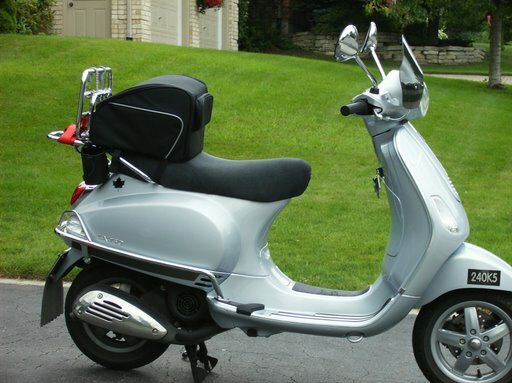 A larger scooter, such as the GT200 or GTS250ie will likely provide more room. Also, I am 6 feet in height, and individuals with a smaller stature may not notice the loss of leg room as much. I find with the Pak Rest that I do sit more forward on the seat than I typically do. It feels much as if there was a passenger behind you. Very similar to having a passenger, I found that I had to make adjustments for my riding as the scooter felt less stable. Fortunately, that feeling disappeared after I became more used to having the Pak Rest on the Vespa. Okay, I'll make a confession. For the first couple of trips, resting my back against something just felt unusual. Pretty soon, however, that feeling gave way to one of comfort and connectedness. I actually feel more anchored to my scooter around corners with the the Pak Rest. It is also nice that some of the strain is removed from the arms from being able to rest against the bag. At not time did the Pak Rest feel like it was going to give way. Even with my 195 pounds pressing back, it felt secure and stable. Very nice! A very nice discovery, and one I would not be able to offer if I had written this after the first week of ownership, is that the Pak Rest does "adjust" to your size. What I mean, is that from my leaning back, the bag appears to have compressed a small amount in length - just enough to give me my some of my leg room back. Since I wanted to use the Pak Rest to help with errands, I put it through the "real world" test of carrying groceries. Here the Pak Rest really shows what it is capable of! I was able to install it in moments. A brief trip to the store, and I was out with 5 bags of groceries, a flat of 24 Pepsi, and large pack of bathroom tissue. Before, I would have had to carry three or four of the grocery bags on my seat hook, interfering with my feet and putting who knows how much strain on the hook. The heavier cans went into the pet carrier, the Pepsi and bathroom tissue were on the folding rack, while three of the bags went into the Pak Rest! That left a bag of the lighter items (bread, bagels, and what have you) for the seat hook. Not bad, and very easy to load up! From the comments of the 3 gentlemen who took turns coming up to ask me about it, they were also impressed with the capacity of the bag. So, after several weeks of ownership, here is my summary of the Pak Rest. I really like the quality of the bag, its appearance and ease of installation and removal. It does exactly what I intended it to do, be a temporary way of carrying more stuff when needed. Having the carrying handle on the rear is a nice touch. It can carry a lot of items, in a secure and stable manner. The price is also very reasonable for the quality that you are receiving. 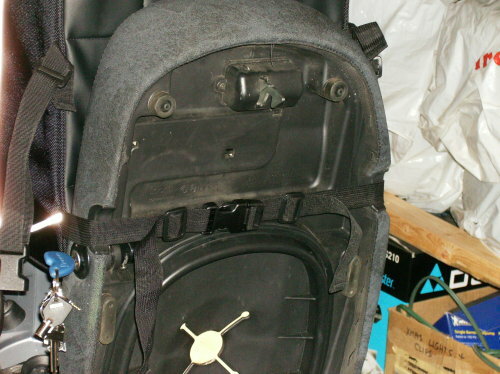 What I don't like so much is the difficulty with finding a secure mounting location at the rear of the LX150's seat. Perhaps this is not so much of a problem with other scooter seats, but it is with my Vespa. Still, I was able to work around this without too much difficulty. The length of the Pak Rest, in my opinion, is a more significant drawback. I felt as if I was sitting too far forward, but would be more comfortable if the bag was shortened by a couple of inches. Perhaps this is a particular problem only for the smaller LX150, but it stops me from offering full kudos for this bag. If SX Appeal does revise the Pak Rest to make is shorter, I would gladly test it out! 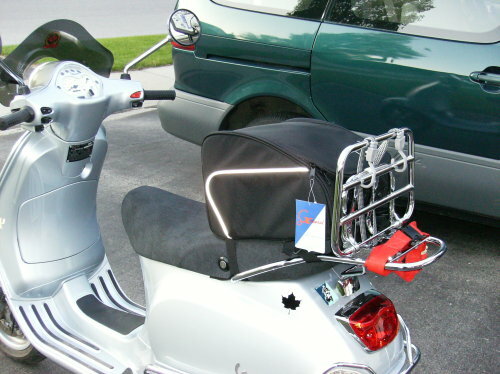 I consider the Pak Rest to be a good choice for someone who does not want a topcase, but wants to temporarily add storage to their scooter. I am satisfied with mine, and will continue to use it. A full thumbs up to SX Appeal for seeing a need in the scooter accessory market, and responding to it with style and function! Just wondering if the case offers you back support when empty or only when carrying items inside? I found that it still offered back support when empty. There is a supportive framework inside that allows the case to retain its stiffness while empty. When I first used it, I spent time pressing backwards while it was empty and it gave - a little bit. It the inner material was of weak construction, I am fairly certain that it would have given more. What the longterm durability of the supportive frame is, say over more than one year, I don't know. However, I expect that the workmanship is up to the task. Have you tried the pak-rest mounted on the rear rack yet? I'd like to consider it as a temporary topcase, until I find something I like. I like the regular roll-style canvas bags, but if the pak-rest would work well on the rear rack for a while, I think I'd get more use out of it. I'd have it as a topcase for a while, and then as just additional storage for longer trips in addition to a different topcase. Do you think the interior structure of the case would hold up well on the bottom? Would it mount without too much trouble to the rack? I may end up carrying a passenger, and still want extra storage. Have you tried the pak-rest mounted on the rear rack yet? I'd like to consider it as a temporary topcase, until I find something I like. No. I bought it for use as a pillion bag. I am not sure if the mounting straps would line up properly for use as a rack bag. You can contact Motorsport Scooters to find out for sure. Thanks for posting this. 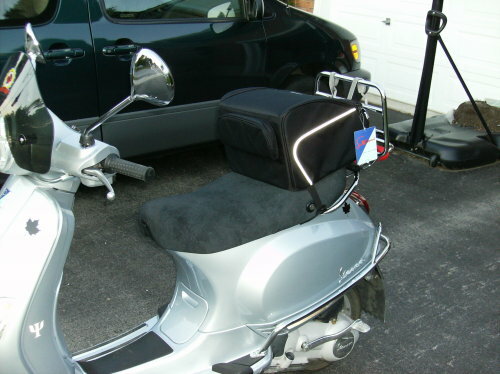 I've been considering options for a rear seat bag with a back rest for my Piaggio mp3 400. I have short legs and arms and end up sitting well forward of the "dip", so I need something like this that will bridge that gap. I have recently been thinking about a custom seat. Single seat with the passenger space converted to a cool looking storage compartment. Much like Corbin makes for the T-Max. Your post was 2006 and now it's 2015 and I'm looking for this and can't find it. I want some back support for my GTS 300 and extra storage is a bonus. There are other products but wondering if this is still available anywhere? Maybe i'll search ebay. I've been using Pak-rest for about 7 years, on Rally, PX, GTS and 946. One of the best accessory I've ever bought. We discontinued the PakRest about 4 years ago. I think Nelson Rigg might makes a similar product still.